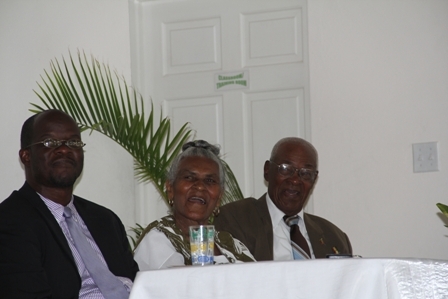 NIA CHARLESTOWN NEVIS (AUGUST 13, 2012) — Attorney General and Area Representative for the Parish of St. James Hon. Patrice Nisbett, urged members of the communities who will utilise the newly renamed Franklyn A Browne Community Centre to maintain high standards that would ensure that Mr. Browne would be proud to have his name associated with the facility. He addressed the villagers of Camps, Liburd Hill, Scarborough, Barnaby, Potworks, Mount Lilly and Rawlins when he delivered remarks at the official renaming ceremony of the Combermere Community Centre at Combermere on August 9th 2012. Mr. Nisbett noted that the ceremony brought with it a fair measure of pride to those who witnessed the renaming in honour of a man who had survived the Christena Disaster, one of the most catastrophic events in the history of St. Kitts and Nevis. “It is said out of adversity comes good. I believe your family is proud, the community is proud and all the lives that you have been able to touch and make a difference in are proud of this signal honour and achievement. The name of this centre is in honour of a son of the soil here from St. James. “Mr. Browne the honour this afternoon that has been bestowed upon you is in recognition and appreciation of the contribution that you have made to family life, community development and to nation building,” he said. 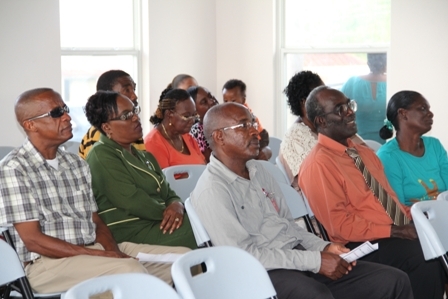 The Area Representative also lauded the Nevis Island Administration headed by Premier Hon. Joseph Parry and by his Deputy and Minister of Social Development Hon. Hensley Daniel for the honour bestowed on Mr. Browne. “Let me commend the Nevis Island Administration led by J.W. Parry ably assisted by Hensley Daniel for seeing it fit to honour our neighbour, our teacher, our community man and our noble friend Franklyn A. Browne. Congrats. May God continue to richly bless you and your family,” he said. According to him, Mr. Browne had long been associated with the ideal of excellence and had always ensure that those under his watch continued that long established tradition of excelling in their pursuits in life. “It is felt that this community centre, while carrying out its function as a centre of learning, will at the same time become a centre of excellence. 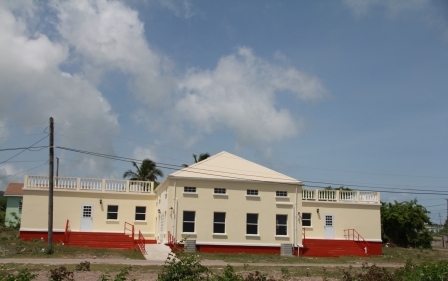 It is my fervent hope and expectation that when the name Franklyn A. Browne is etched in this building it will inspire the young people of this community to become involved in community work so that they can lead lives that eschewed the characteristics of crime and violence and other anti-social ills. It indeed represents countless opportunities through the provision of the various programme to the youths of this area,” he said. Meantime, Mr. Nisbett also praised the NIA’s efforts to contribute to the process of community development and its commitment to ensure that the environment engendered for the people of Nevis was just, inclusive and a more cohesive society that worked for all. He cited that the centre at Combermere, a first for the area, like several others constructed recently, represented that.